We’ve extensively expanded and updated this guide for 2018 — and we’re very glad that we had to do so! It means that progress is being made. Much still needs to be done of course. But cannabis legalization is spreading faster than ever before, and more and more of the world is starting to recognize the harms and absurdity of prohibition. Read on to find out where cannabis is now legal, in what form and to what extent. Visiting another country or the US? Confused by the marijuana laws there? While it is legal to consume any drug in Oregon in the United States, the Philippines has passed a law permitting anyone to murder a drug dealer with no punishment! This article will take you around Europe, the Americas and Australasia and show you what it’s currently legal to do and where when it comes to weed—medical and recreational. We will also take a brief look at certain countries with the craziest anti-drugs laws in the world, places where it could be suicidal even to have any weed on you. Nine states and Washington DC have either decriminalized or legalized all use of marijuana. 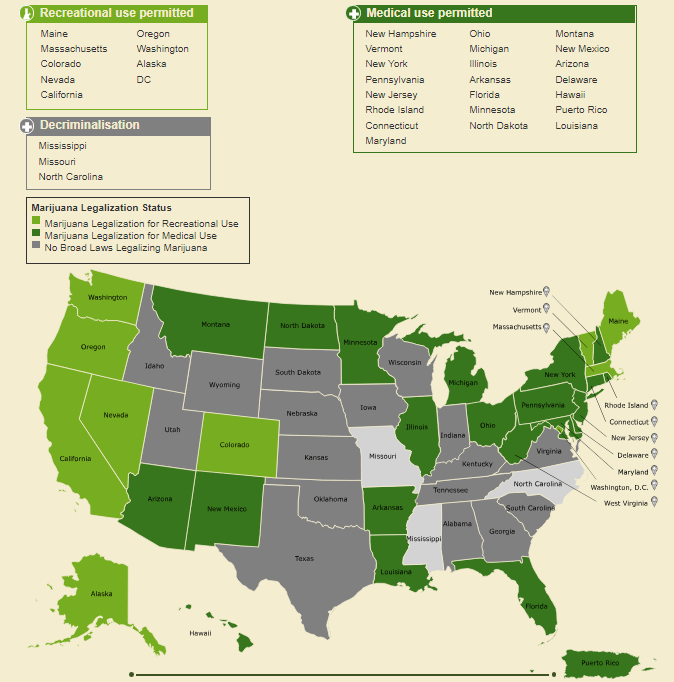 On top of this, 29 states now permit medical use of cannabis. The industry now makes $10 billion annually in sales, so should there be a crackdown from the Federal government the genie is out of the bottle. In addition a recent Gallup poll suggests that 64% of Americans support legalization in some form. It is important to note though that marijuana is a Schedule 1 narcotic under Federal Law so you could still in theory be arrested by Federal agents for possession. Even in states where recreational use is permitted, some employers may drug test you and fire you for use. You should always be careful about carrying anything including pipes with any residue across state lines (even between states that permit use) or flying while in possession as you could be arrested by the FBI, DEA or ATF. The following information on marijuana legality in the US was harvested from ProCon.org. CBD: Cannabidiol – a secondary psychoactive substance in cannabis. It is important to note that some cities in CA, notably Fresno and surrounding areas, have banned recreational supply dispensaries. Where can be bought From one of 10 state licensed dispensaries. You cannot legally buy marijuana in Maine. In November 2017 the governor vetoed a state bill permitting regulation and taxation. Negotiations are under way between the legislature and governor. Other laws on consumption: Must only be from state licensed manufacturers and cannot be in a smokable form. State website for laws here. First time offence, no prison time or criminal record for a small quantity. Will be treated like a minor traffic conviction. Larger amounts or a second time offence could land you with jail time, a heavy fine or a driving ban. A bill for legal medical marijuana has also been making good progress and is due to go before the state Senate. However, there are a few doubts about whether it will clear the final hurdles. Possession type oils, tinctures, plant material, edibles, patches. Other laws on consumption While laws are being clarified, less than 100 grams (3.5 oz.) possession can result in driver license suspension or a fine. Law summary here. Medical only However, in Philadelphia you will not be prosecuted for possession for recreational purposes as of 2018. VT became the first state to legalize through its legislature and not through a ballot in early 2018. There are no legal dispensaries. Where cannabis can be bought If sold by someone over 21, from anyone or dispensaries. Can be grown at home. As of summer 2018, provinces will be allowed to regulate marijuana use, growth and sale for recreational purposes. There is no fixed date set for the law to be passed in the national legislature due to strong opposition from the Conservative Party. It is likely to be legalzed before the summer recess in 2018. Different provinces will handle legalization in different ways. Though the industry is set to explode across the country, there will be different ways of handling it according to where you are in Canada. 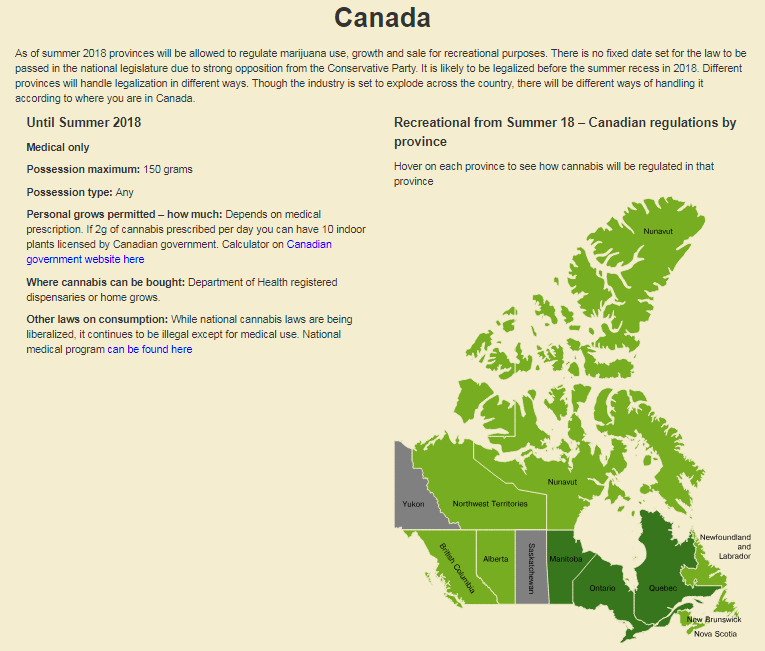 Where cannabis can be bought Department of Health registered dispensaries or home grows. Where you can buy: Province owned dispensaries. Licensed private stores. Driving Impairment law: 90 Day Administrative Driving Prohibition for drug driving. Zero tolerance for those on Graduated Licensing Program. Where you can buy: Licensed private stores and public dispensaries. Online through private stores. Driving impairment: Temporary driving ban, possible impoundment of vehicle. Zero tolerance for under 21 drivers under the influence. Where you can buy: Strictly through Nova Scotia Liquor Corporation (NSLC). Online through NSLC stores too. Where you can buy: Only through Liquor Control Board of Ontario (LCBO) stores. Driving impairment: Temporary bans, zero tolerance for under 21s. Driving impairment: Special summary offence where a minor is in the car. Driving bans can be imposed too. Where you can buy: Société Québécoise du Cannabis (SQC) stores only with ‘some exceptions’. No firm regulations in place as of publication. All public production and consumption is legal. This is being regulated backwards by Congress now, which is considering a bill to grow up to six plants for ‘medical, recreational or spiritual reasons’. Personal use and possession decriminalised. Possession of up to 20 plants or 20 grams will be ignored. 14 medical marijuana dispensaries have recently been licensed, with users permitted to use with a medical prescription. Rastafarians can grow and use. Where cannabis can be bought (Decriminalized) from streets. Medical program being fleshed out. Other laws on consumption Law a bit of a mess but being slowly clarified. Growing can be an arrestable offense. Police can be bribed. 5 grams possession decriminalized. Medical program only permits strains of a maximum of 1% THC – many debate therapeutic potential at this level. 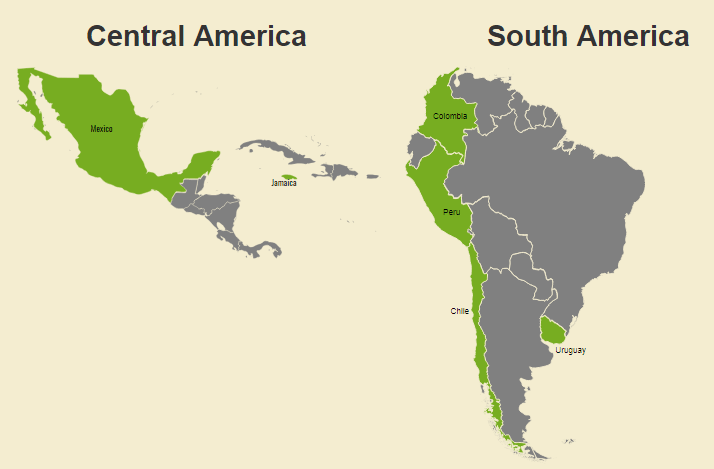 In November 2017 Peru passed a medical marijuana legalization law. It is legal to possess, sell and transport it for medical purposes but it is illegal to grow it. Fully legalized for medical or recreational purposes. Cannabis legality in Europe – things are less straightforward in the Netherlands than you’d imagine. Europe has a variety of drugs laws where the police may turn a blind eye to small scale use in different countries. We present the highlights here, though these are not the only countries where the police may turn a blind eye due to other priorities. With a doctor’s prescription you can access medical marijuana through pharmacies. It is imported from The Netherlands and there are frequent shortages. The country has lax enforcement for recreational use. In many nightlife areas, smoking is tolerated. Freetown, a suburb of Copenhagen is a ‘Green Light District’ where national marijuana laws are disregarded by the police. Outside of Freetown it is still illegal and could result in prosecution. Where it can be bought: Through pharmacies. Other notes: With strict medical agreement from your doctor you can apply to access marijuana through the Finnish government FIMEA. Medical use with a prescription. Without one if you are busted this is a health issue and not a crime – you will have to undertake state supported withdrawal. Medical marijuana was legalized in mid 2018 though full details are yet to emerge as to what is legal and how. A new project has been launched to grow and sell it, projected to create well paid 2000 jobs in a country struggling with a financial crisis. Doctor must try alternative treatments for a condition first. Supply bought from a pharmacy which can only buy supply from the Italian Army, which grows it in a fortified facility in Florence. Physician will have to see you each time you need to get a repeat prescription. Possession type Oil with a maximum content of 0.2% allowed over the counter. Doctors will have to prescribe an oil containing more than 0.2% cannabinoids. Only neurologists, radiologists, infectious diseases specialists and oncologists can prescribe for specific conditions. Cannabis use is only ‘tolerated’ in the Netherlands. You are still breaking the law by growing, trading or smoking it. It is not ‘legal’, and therefore is not taxed, though there are set regulations governing what and where can be grown, sold or consumed. This varies from city to city so do check before you grow. Possession maximum 5 grams for recreational use. Coffee shops are allowed to stock up to 5oz. Medical cannabis differs, though is much harder to get, and the varieties available are limited so many Dutch use coffee shops instead of the state medical programme. Personal grows permitted – how much None. The police raid grow operations too and you can be hit with a €67,000 fine. Where cannabis can be bought Medical – through licensed dispensaries. Recreational – Coffee shops that are not within 350 metres of a school (Amsterdam) Other cities only permit Dutch citizens with a ‘weed pass’ to purchase. Other laws on consumption A critical explanation of the Dutch medicinal cannabis laws can be found here. Recreational – a new law is passing through the Dutch Parliament to allow certain growers to grow and supply coffee shops. Home growing is still very risky. Medical use only, and in theory accessible through 90% of Polish medical pharmacies. Growing illegal, so has to be imported. Supplies consequently difficult to access. Law only passed in late 2017 so this should stabilize in the next 12 months as the law is clarified. Drug use is considered a medical problem in Portugal. You cannot be arrested for small quantities of most substances. Personal grows permitted – how much None. Expect jail time. Possession of seeds or growing equipment can result in jail too. Where cannabis can be bought Nowhere. Someone selling personal use quantities of cannabis can face a less arduous punishment than someone selling kilos though. While you cannot purchase cannabis legally in Spain there are some very liberal drug laws. In some places, the police won’t bother you if you’re smoking a joint outside. Take care to understand the law below, however as you could still be thrown in jail for not observing the law. Possession maximum ‘Personal use’. Don’t carry enough to get a busload of people caned. You are allowed to grow your own for personal consumption, though this is not legally limited. Personal grows permitted – how much You will not be arrested for growing for personal consumption. You are allowed to buy seeds and cultivation equipment. You are not allowed to sell it. Where cannabis can be bought Nowhere! It is illegal to sell, though some authorities such as Catalonia have effectively decriminalized the sale of small quantities. Cannabis clubs are extremely popular where friends can pass a joint round. Personal grows permitted – how much. Permitted to grow low THC, high CBD plants. The Swiss love CBD! Where cannabis can be bought Through headshops as you might other cannabis paraphernalia. Again, sub 1% THC cannabis products only. Medical only, and in only 19 of its 81 provinces. The law has yet to be clarified. Recreational possession or use can be punished with two years in prison, or up to 10 years for sale. 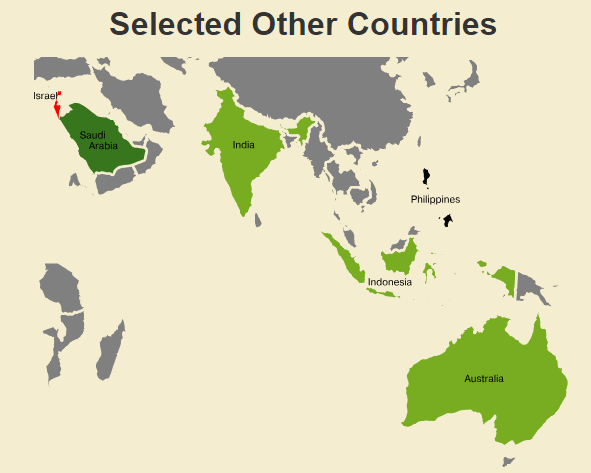 Weed legality and illegality in rest of world – avoid the Philippines, Saudi Arabia and Indonesia at all costs! Where cannabis can be bought TBD though it is expected that cannabis dispensaries will be permitted to sell. People have used cannabis in India for 5000 years. The British didn’t succeed in eradicating it in more than 300 years of occupation. And despite the 1985 Narcotic Drug and Psychotropic Substances Act 1985, no one really cares. You will see spiritual people smoking the stuff outside of temples regardless. A law only works if people generally observe it. If no one cares then it won’t work! Before you light up a joint, do check with the locals. It is considered legal in Goa, the Parvati Valley, Varanasi, Pushkar, and Kerala. Under the national law, bhang is legal everywhere. This is a milky, sweet drink with cannabis in it, generally drunk in large quantities around the Hindu festival of Holi. Other laws on consumption In early 2017 it was decriminalized for personal use. You will be finned 1000 Shekels if busted for the 4th time. Keep your grow to yourself and don’t be too wild in front of the police or military. If you have 0.3oz you are considered a drug trafficker. That means the person catching you – anyone in the Philippines – has the right to execute you. Yes – execute you without trial. A great place for a complete detox. Even smuggling in alcohol can result in you being tried under Sharia Law and beheaded in a public square. Image credit: Amsterdam Coffee Shop Menu.